There are four things that distinguish the Timeless Tales series from Disney's most abundant low-priced shorts compilation line, the Classic Cartoon Favorites. Firstly, the suggested retail price for the Timeless Tales is $5 higher. Secondly, the packaging for the Timeless Tales emphasizes the selected shorts' educational value for youngsters - a parenting guide and glossy little storybooklet are included inside each volume. 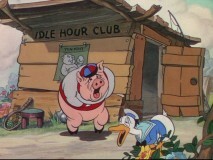 Thirdly, the Timeless Tales shorts are less adherent to a formula or a series; all but one of the first nine Classic Cartoon Favorites volumes have offered cartoons running the fairly standard 6-9 minute length and starring recognizable Disney personas such as Mickey Mouse, Donald Duck, and Goofy. The fourth difference seems to result from the third. The cartoons that populate the Timeless Tales series typically have reputable literary origins and tend to be both more memorable and renowned than shorts of the duck-gets-angry-at-[insert source of anger here] variety. were included in the debuting wave's Silly Symphonies collection and the former appeared again on The Chronological Donald, Volume 2 (it introduced the irascible duck who would soon become Disney's favorite cartoon short protagonist). The last two shorts -- "Morris the Midget Moose" and "Ben and Me" -- were not at all available on DVD in Region 1...until last month when both showed up on the Walt Disney Treasures tin Disney Rarities. As has usually been the case for Disney's low-priced cartoon compilations, Timeless Tales: Volume 3 is not so much tailored to the animation enthusiast who stocks up on Walt Disney Treasures. Instead, this DVD seems more intended for the casual Disney fan of Disney cartoons, the parent in search of an attractive hour-long disc to babysit their child, the picky collector who prefers themed samplings to exhaustive chronological canons, and the extremely ardent Disney buff who wants it all. Though most readers of UltimateDisney.com might not fit into any of those groups, the demographics are clearly substantial enough to justify a now-flourishing market of low-priced, hour-long cartoon collections. 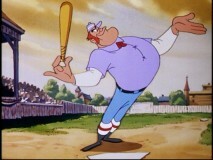 Ernest L. Thayer's famous 1888 poem of Mudville's adored slugger Casey and his much-anticipated bottom-of-the-ninth heroics is marked by silly visuals and an old-fashioned, musical rendition of the lyrics. 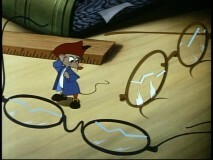 There are doubtlessly more effective ways to adapt this memorable story than this zany Warner-style 'toon, but this highlight of Make Mine Music (which is accompanied by later-generated end credits of its own) is spirited enough to retain some of Thayer's wit and a touch of its heartbreaking ending. A small Indian boy heads for the forest to hunt assorted animals. He has trouble finding success (and keeping his pants from falling down too). When he becomes the prey for a fierce bear, the tinier woodland creatures he failed to kill lend him helping hands. There's only a shred of Henry Wadsworth Longfellow's epic poem The Song of Hiawatha in this lighthearted jaunt. This short would be noteworthy for the introduction of Donald Duck alone, but it is actually quite entertaining regardless. Donald and fellow loafer Peter Pig cite continuing bellyaches to get out of helping the clucking title character in her efforts to plant and harvest corn. Of course, the joke is on them, as they wind up not with tasty corn treats but with tummy medicine. 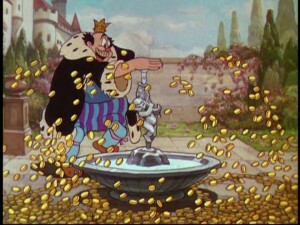 Disney tells the well-known Greek myth of King Midas, a greedy man who gets a wish granted (by a bald elf-like chap) for everything he touches to turn to gold. As you probably know, his blessing turns out to be a curse when the reality sets in and poor Midas can't even bite into a turkey. This Silly Symphony was one of the last shorts that Walt Disney himself directed and though his treatment seems unextraordinary, the tale still resonates and thus, the short diverts, regardless of the contempt Uncle Walt is said to have held for it. In this amusing little short, an elder beetle tries to impart a lesson to two young bugs who are feeling bad about their shortness. He tells the story of Morris, a diminutive moose with normal-sized antlers. Morris teams up with a full-grown moose with tiny antlers and together, they make for an imposing combination that threatens even the fierce leader Thunderclap. Easily the longest cartoon of the disc, this is also probably its best. It tells the little-known story of a poor church mouse named Amos who is truly responsible for the great innovations attributed to Benjamin Franklin. 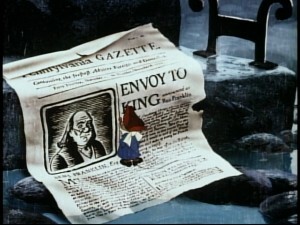 Their tumultuous friendship spawns many a discovery and plenty of renown but Franklin's shocking (literally) treatment of the Amos (voiced by the legendary Sterling Holloway) results in them splitting ways only to reunite in time for the writing of the Declaration of Independence. Clever and charming, "Ben and Me" would have been an exciting Region 1 exclusive if it hadn't just showed up as one of the many underexposed gems of the Disney Rarities tin. Disappointingly, the extended version of this short, which apparently later showed up on television and is reported to run 8 minutes longer than the theatrical cut, is not presented here. That would have given even Disney Rarities owners a reason to consider picking up this disc, but instead, you'll have to look to the UK's Walt Disney Fables: Volume 3, part of the Region 2 line that clearly paved the way for Timeless Tales. When you're dealing with cartoons that range in age from over 50 to over 70 years old, you can't really expect perfection. This is especially true when you're talking about one of Disney's budget shorts compilation discs, which never get the type of restoration treatments bestowed upon Walt Disney Treasures DVDs. Fortunately, as already mentioned, all six cartoons have previously appeared on DVD over the past five years, including four through the Treasures line. Accordingly, they look quite good for their age. impresses too. 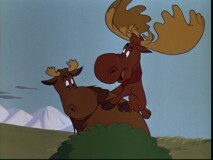 A side-by-side comparison reveals that "Ben and Me" and "Morris the Midget Moose" look practically identical to their recent Treasures debut; only the most minimal of color differences (with no clear winner) separates the two. 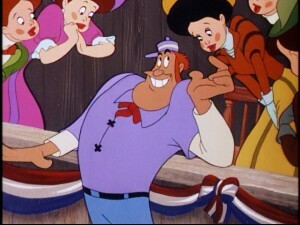 Remastered transfers appear to have been recycled for all, which explains why "Casey" looks the weakest (having arrived outside the Treasures) and why by and large, the picture quality is leagues ahead of what you could expect for cartoons of this age that have slipped into the public domain. 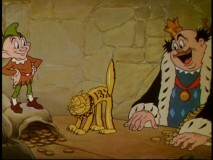 Fortunately, a repeat of the Timeless Tales' greatest offense (providing a cropped version of The Prince and the Pauper on Volume 1) never came into question here, as all of the shorts were created for the 1.37:1 Academy Ratio, which is approximated in the fullscreen presentations offered on this disc. Some framing is suspiciously tight, but obviously no all-out pan-and-scan jobs were necessary or done. The case claims it is a Dolby Surround presentation, but as far as I could tell, it was straightforward Mono encoded as two-channel sound. That's fine because it is how the shorts were made. The DVD's soundtrack (also offered in French) is unremarkable but entirely serviceable. As is true to the Timeless Tales concept, there is but one supplement and you won't find it on the DVD. 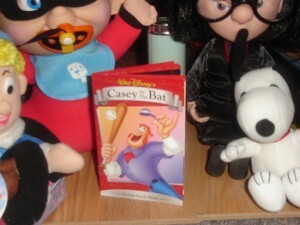 It's a little soft 12-page (8 aside from the glossy promotional covers) storybook of "Casey at the Bat" featuring the original text by Ernest L. Thayer and images from Disney's short. Arranged like prose the way the first two volumes' abbreviated texts were, it inanely makes the rhyming part less obvious for young readers but serves a purpose - saving blank space and in turn pages and money. Would the additional 4 pages found in the first two volumes' booklets make a major difference to a multi-billion dollar corporation? 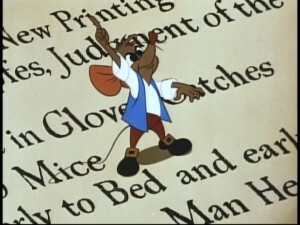 No and it would make the poem easier to follow, so Disney strikes out there. Even so, the Thayer poem is preferable to the cartoon but does not make for a very special keepsake or the slightest bit "collectible" as promised. For having a list price $5 greater than the Classic Cartoon Favorites discs, if Disney feels compelled to tout a collectible storybook, they should package the DVD case in front of a nice hardcover storybook. But I'm sure they'll continue to weigh however many cents-per-unit profit over customer satisfaction on this line and plenty of purchases may even overlook the cheap booklet. Of course, this disc is equipped with "FastPlay", which subjects the viewer to ads both before and after the movie and rewards them with the gift of not having to press a single remote control button (unless, for some reason, they want to resist passivity or watch only an individual cartoon). The pre-feature previews promote Lady and the Tramp: Platinum Edition, Disney Channel Movie Surfers segments on The Wild and The Shaggy Dog, and forthcoming midquel Bambi II. The menu holds additional spots for Pooh's Grand Adventure: The Search for Christopher Robin, Leroy & Stitch, Chicken Little, and The Little Mermaid: Special/Platinum Edition. 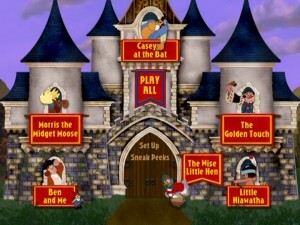 The 4x3-encoded menus match the first two volumes with a brief forest walk leading to a static castle inhabited by seven characters from the selected shorts at each window. Actually, Amos appears to be standing outside as is The Wise Little Hen, who intentionally or not, has now become Little Hiawatha's target. Naturally, the same whimsical instrumental music plays. The Main Menu offers you the opportunity to Play All or select an individual short. The files are encoded as individual files so that playing one short returns you to the menu afterwards rather than following up with the rest. If you exhibit some selectivity in acquiring DVDs of vintage Disney cartoon shorts, Timeless Tales: Volume Three isn't a bad collection to obtain. The solid sixty-five minutes of animation doesn't quite justify the $19.99 retail price (even considering the cheap storybooklet inside the case), but if you can agree to wait for a sale or price drop, this disc ultimately could satisfy you as a random sampling of the studio's more worthwhile shorts. 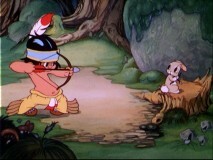 If you don't want to track down "Little Hiawatha" on Pocahontas II, wait for a second Silly Symphonies release, or buy the unfortunately edited Make Mine Music DVD, this disc also provides two good shorts without a hunt or excessive spending. But, as has been said plenty of times before, the only collectors of the Walt Disney Treasures line who might want to buy this are extreme completists and those who like the idea of playing this cartoon lineup without the need for switching discs and swapping tins. Outside of that demographic, this release is fairly superfluous for those buying the high-end cartoon Treasures and will primarily appeal to those less concerned with owning all the Disney shorts with all the bells and whistles.